If you secretly enjoy holiday lights but want it in a spoopy theme, then this Skull Charger will be a must-have. 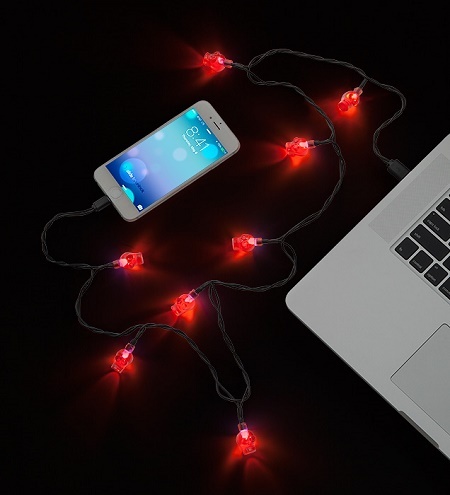 This is a 46” long charging cable that is riddled with red skulls that light up while your phone is powering up. It is a lightning connector, so it will only work with iPhone 5+, iPad 4+, iPod Touch, etc. Basically, if you’re not a current Apple fan, you’re out of luck. This has 8 LEDs in red skulls, which means it should keep lighting up for years to come so long as you don’t needlessly leave this plugged in at all hours of the day. This is only going to cost you $14.99, and will let anyone near you know that you have holiday spirit. Whether or not they pay attention to the fact that it’s for Halloween or not will be based on how far into your personal space bubble they’re willing to tread.